At Chasing Treasure, we offer a fine collection of jewelry boxes and jewelry armoires for women, men, and children. We also sell a beautiful collection of musical trinket boxes in a variety of shapes like animals, shoes, hearts, and holiday shapes. One of our largest collections of trinket boxes come in the shapes resembling the famous Faberge eggs. Many people have heard of Faberge eggs, but few know the story behind them. The real Faberge eggs were created between 1885 and 1917 and were originally created as Easter eggs. These first eggs were created by the House of Faberge in Russia and many of the larger ones were given to the royal families of Alexander III and Nicholas II. The first eggs were actually quite small and could be worn as jewelry, which the bigger ones, about 50 of them, are called the Imperial Faberge eggs. 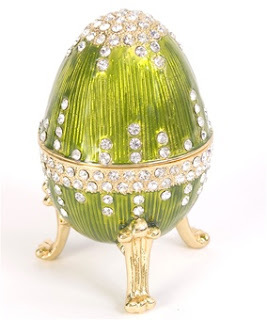 The original Faberge eggs are designed with precious stones and metals, making them quite valuable. The eggs are luxurious and many have precious gems included in the enamel eggs. There were 65 eggs made and only 57 are still around today and there are 42 Imperial eggs still in existence. When the Russian Revolution occurred, the eggs and the House of Faberge became a part of the Russian nationals. The family moved to Switzerland and the eggs were moved by Lenin’s order. A few years later, Stalin sold several of the eggs to raise money for the country. Interestingly, Armand Hammer bought the majority of the eggs. Throughout history, the eggs have moved to a variety of different places and at one point, American millionaire, Malcolm Forbes showed a collection of the eggs in New York City. His collection was sold at auction for approximately $100 million. There have been other Faberge pieces that have sold for extremely high amount of money. One of the eggs which actually contains a clock sold for approximately $13 million; this egg, called the Rothschild egg, holds three records as the most expensive Faberge and Russian piece of art ever sold along with the honor of being the most expensive clock ever sold, too. Faberge eggs have a special place in our culture, even though there are so few of them and most people will only see them in museums or in photographs. The eggs have made appearances in movies and television shows. The Faberge name is now associated with fine jewelry, but the original eggs are some of the most expensive and treasured pieces of art today. At Chasing Treasure, our Faberge eggs are not from the House of Faberge, but they are created in the same style as many of the eggs. Our Faberge egg trinket boxes have enamel work on pewter or brass. They then have Austrian Swarovski crystals and 24k gold details. The boxes are lined with velvet and each one has a ring roll so you can store your treasures or give one with a ring inside of it. Many of our eggs are presented on decorative legs or tripods. They may not be the real thing from the House of Faberge, but they make lovely gifts.